A challenging and fun inflatable combination of the popular games 4 SPOT and Tic Tac Toe! 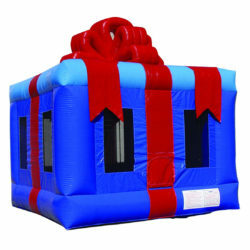 A combination inflatable maximizes the value of the piece! Dimensions: 8’w x 6′ 5’’w x 10’h, Weight: 51 lbs. or diagonally – while trying to prevent their opponent from doing the same. Be the first player to get four of your colored game pieces in a row – horizontally, vertically or diagonally. Tic Tac Toe or X’s and O’s was originally a game only played on paper. Now, this traditional game is resized to Giant proportions and can now be played on any surface indoors or out. The game takes on a whole new dimension when it is played in Giant size with GIANT foam game pieces. The inflatable game is easily transportable, lightweight and playing area measures about 6’x 6’ square. Each player gets 5 giant X’s and 5 giant O’s. The X player usually goes first and in order to win, all you need to do is place 3 of your game pieces in a row horizontally, vertically, or diagonally.